International Team for Implantology (ITI) Congress North America is organized by International Team for Implantology (ITI) and will be held from Apr 25 - 27, 2019 at San Francisco Marriott Marquis, San Francisco, California, United States of America. Who is attending? The ITI Congress North America will be attended by approximately 1,000 visitors, an informed audience of specialists in the field of implant dentistry. Participants are active in the field as: Participants are active in the field as: • General dental practitioners • Oral surgeons • Maxillofacial surgeons • Dental technicians • Dental hygienists • Specialist dentists from various fields • Researchers Additional details will be posted as soon as they are available. The Society for Pediatric Radiology (SPR) 2019 Annual Meeting & Postgraduate Course is organized by The Society for Pediatric Radiology (SPR) and will be held from Apr 30 - May 04, 2019 at Hilton San Francisco Union Square, San Francisco, California, United States of America. The target audience for this medical event is pediatric and general radiologists. CME Information: The American College of Radiology designates this activity for a maximum of 37.75 AMA PRA Category 1 Credit(s)™. Physicians should claim only the credit commensurate with the extent of their participation in the activity. Technologists: The American College of Radiology is approved by the American Registry of Radiologic Technologists (ARRT) as a Recognized Continuing Education Evaluation Mechanism (RCEEM) to sponsor and/or review Continuing Medical Educational programs for Radiologic Technologists and Radiation Therapists.The American College of Radiology designates this educational activity as meeting the criteria for up to 37.75 Category A credit hours of the ARRT. SAM Credits: Select sessions from this activity meet the American Board of Radiology criteria for a self-assessment (SAM) activity and are designated SAM credits toward the ABR Maintenance of Certification program. The total SAM credit amount is 14.25. Conference Objectives are: • Summarize the most current information on state-of-the-art pediatric imaging and the practice of pediatric radiology. • Describe and apply new technologies for pediatric imaging. • Describe and apply basic principles for implementing quality and safety programs in pediatric radiology • Discuss trends in research concerning the care and imaging of pediatric patients • Identify common challenges facing pediatric radiologists, and possible solutions. • Evaluate and apply means of managing radiation exposure and the need for sedation/anesthesia during diagnostic imaging and image-guided therapy. Botox Training Course is organized by Empire Medical Training and will be held on May 04, 2019 at San Francisco Marriott Fishermans Wharf, San Francisco, California, United States of America. 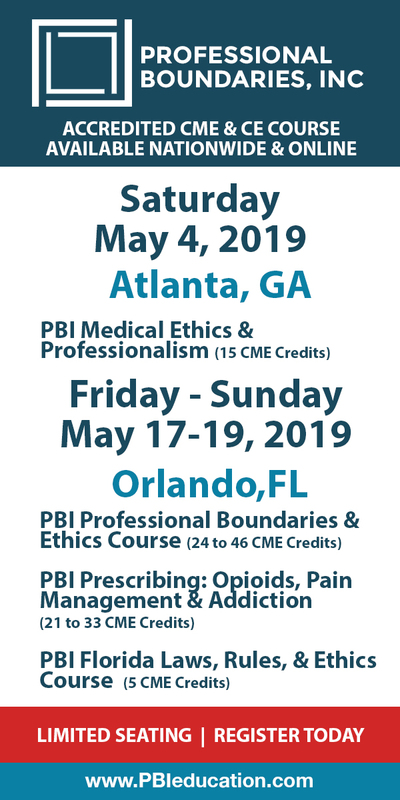 The target audience for this medical event is Physicians, Nurses, Dentists, and other Licensed Healthcare Professionals who are eager to learn a specific skill set associated with mastering the injectable procedures. This CME Conference has been approved for a maximum of 8.0 AMA PRA Category 1 Credits. Course Description: The Botox Training classes are very complete and encompass all aspects needed to fully integrate this new procedure so that you can immediately begin performing these techniques on your own. The general format of the Botox workshop is to receive very detailed lectures in the morning followed by intensive hands-on training in the afternoon with real patients. The workshop gives you the opportunity to use real Botulinum Toxin (Botox) products on actual live volunteers, all medicines and supplies needed that would be used in the training are provided as part of your tuition price. Attendees are also welcome to bring along a friend or companion if you choose to use them for your Botox injection training. There is no charge to volunteers for receiving these free injections. 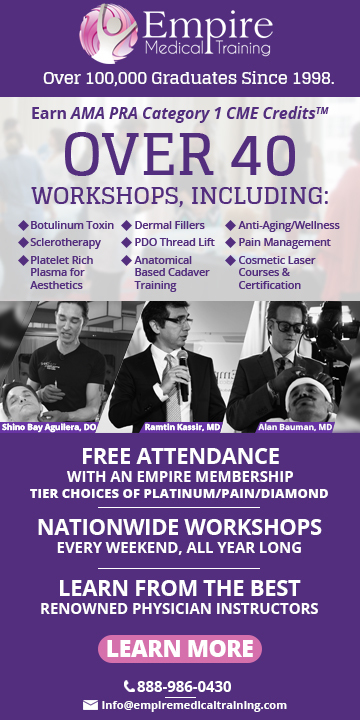 If you are unable to bring a volunteer to the course, Empire will provide you with real patients for the hands-on portion of the Botox Training class. Hands-On Training: Unlike some seminars, our programs are not demonstration only. In fact, attendees are expected and required to administer Botulinum Toxin (Botox) on patients in order to receive their certification. The afternoon session is reserved for intensive hands-on training, where our instructors will be carefully monitoring your technique and style of injecting to help improve your skills. Additional details will be posted as soon as they are available. 2nd Annual Drug Delivery West (DDW) Summit is organized by The Conference Forum (TCF) and will be held from May 06 - 07, 2019 at Marines' Memorial Club & Hotel, San Francisco, California, United States of America. Description: The 2nd annual Drug Delivery West (DDW) Summit provides a west coast venue for biotech, pharma and drug delivery companies to address scientific and business solutions for the best routes of delivery across different therapeutic areas with an emphasis on emerging technologies and to prepare for the future of R&D and clinical care. Who Should Attend: This conference is designed for: From Pharma: • Business Development • External Licensing • Technology Licensing • Portfolio Management • Pharmaceutical Development • Research & Technology Development • Pharmaceutical Formulation/Sciences • CMC • Device Development From Drug Delivery and Specialty Pharma: • Business Development Licensing • Marketing • Innovation & Strategy • Formulation Sciences • Technology Development • Commercial Development Drug Delivery Technologies: • Sustained release/controlled release • Drug targeting technologies • Injectable formulations and devices • Syringe and pre-filled syringe • Needle-free delivery • Transdermal delivery – patches, microneedles • Transmucosal delivery – nasal, buccal, ophthalmic • Ocular • Pulmonary delivery • Oral delivery • Bioavailability & solubility enhancement • Orally-disintegrating tablets and films • Nanotechnology • Smart delivery systems/digital health platforms • Novel excipients • Enabling delivery devices Key Topic Areas for 2019: • Nano-medicine’s Current Clinical Reality: An Analysis of Recent Results • Intracellular and Tissue Specific Delivery • Advances in Brain Delivery • Updates on Alternative Administration of Peptides • Exploring Other Routes of Administration for Ophthalmology • Current and Emerging Drug Delivery Needs in Oncology/Immuno-Oncology • Reducing the Barriers of Getting New Technologies Evaluated and Brought in earlier in Product Development • Nanostructured Materials for Enhanced Therapeutic Delivery • Advancing the Connected and Smart Drug Delivery Ecosystem • The Digital and Connected Health Ecosystem: Incorporating Wellness into the Pharma Model and How rug Delivery will be a Key Enabler • Pharma Spotlights on Drug Delivery Needs • Early Stage Technology Showcase • Investor Perspectives on Drug Delivery Needs and Investments Additional Program Features • Pharma Perspectives on Drug Delivery Needs and Partnering Philosophies • Technology Showcase and Presentations Covering a Wide Range of Drug Delivery Systems • Partnering Opportunities that include One-on-One Scheduled Meetings to Help Foster New Collaborations • Exhibit Hall that provides DDS Demonstrations The DDW Promise: • An agenda with high quality content reporting on trends, deals and science to prepare for the future of R&D and to reduce the burden of delivery to patients. • To provide drug delivery and specialty pharmas with a platform to present their technologies. • To offer ample networking time and partnering services for one-on-one meetings to establish new business contacts and enhance existing ones. Speakers: David Allison, Nima Akhavein, Isabelle Aubert, Sherri Biondi, Matthew Burke, Colin Cahil, Susan Crowell, James Cunningham, Ann Daugherty, Tejal Desai, Vadim Dudkin, Andrew ElBardissi, David Grainger, Zhen Gu, John Higgins, Lori Hu, Sheldon Moberg, Sri Mudumba, Rajan Patel, Andrew Ratz, Kim Ringenberger, Aaron Royston, Dirk Schapeler, Justin Wright, Lani Hack Time: 8:00 am to 5:00 pm Additional details will be posted as soon as they are available.